March 21st marks the beginning of the New Year or Nowruz in the Iranian Jalali calendar. Today, More than 300 million people around the world celebrate Nowruz as their New Year ceremony. 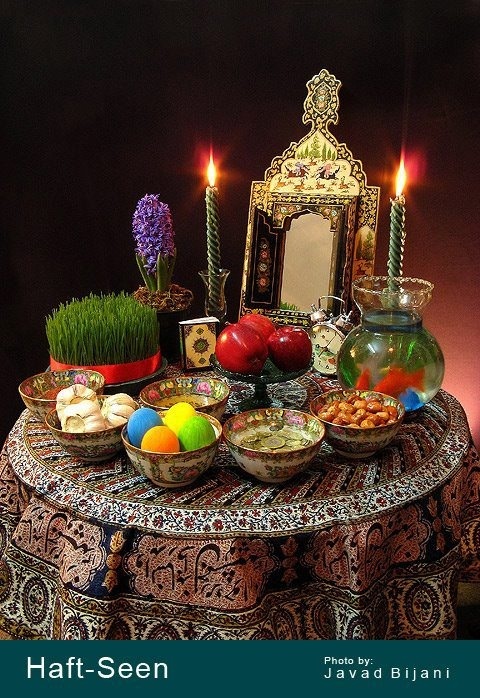 Nowruz is celebrated primarily in Greater Iran, Caucasus and Central Asia. Nowruz has also spread in many other regions of the world, including parts of South Asia, Northwestern China, Crimea, Somalia and Yemen. It is also celebrated by some ethnic groups in Albania, Bosnia, Kosovo and the Republic of Macedonia, and by Kurds in Iraq, Turkey, and Syria, as well as Parsis in the Indian subcontinent. Nowruz is an official holiday in Iran, Tajikistan, Afghanistan, Azerbaijan, Turkmenistan, Uzbekistan, Pakistan, Kyrgyzstan, Iraqi Kurdistan, Turkey, and etc. Also the Canadian parliament passed a bill to add Nowruz to the national calendar of Canada, on March 30, 2009. It is good to know that Nowruz is officially registered on the UNESCO List of the Intangible Cultural Heritage of Humanity. IT IS ALMOST NOWRUZ, SO HAPPY NOWRUZ EVERYBODY! This entry was posted on Tuesday, March 18th, 2014 at 9:51 PM	and tagged with New Year Holiday, Nowruz and posted in General. You can follow any responses to this entry through the RSS 2.0 feed.